I’ll bet your company has project managers, and I’ll bet you have some software or system for managing all the processes and resources involved. It may be a notebook, a spreadsheet, or a project-management system. Twenty years ago, I wrote a bestselling book on the subject. That’s how we used to do project management. It didn’t work then, and it doesn’t work today. We have moved on. We have learned what works better, and we’re constantly improving. In this short essay, I’m going to tell you why and how you should set up a Kanban system for your entire company. 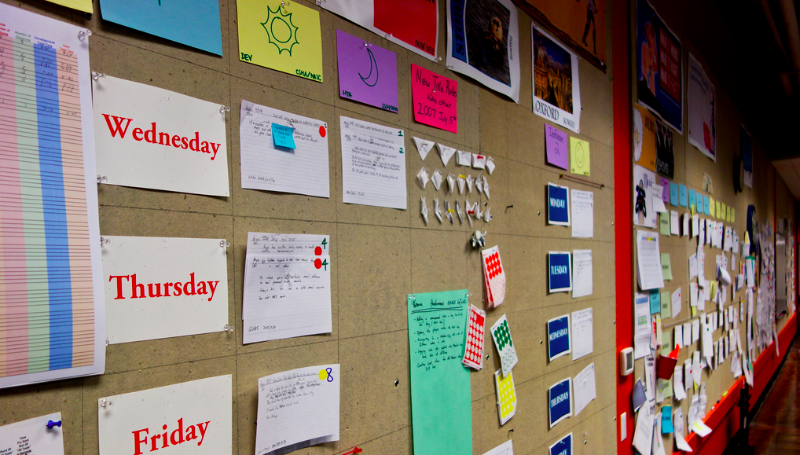 Kanban means “card wall” in Japanese. It’s a system developed by Taiichi Ohno in the 1950s at Toyota. 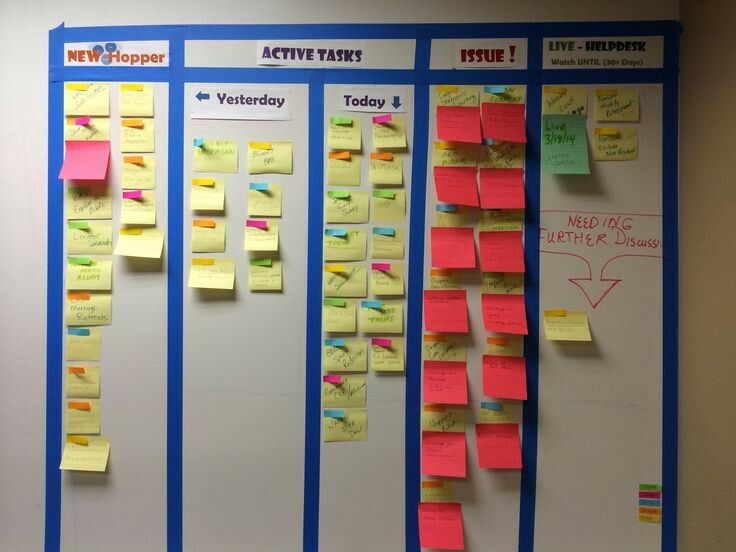 Today, most factories use a Kanban system to manage production flow. It’s part of an overall culture that strives for efficiency, reducing mistakes, reducing backlogs and bottlenecks, and keeps everyone aware of how things are progressing at all times. At the very basic level, a Kanban wall lets you specify work to be done, work in progress, and work that has been finished. It makes work visible, so everyone can see who’s doing what. 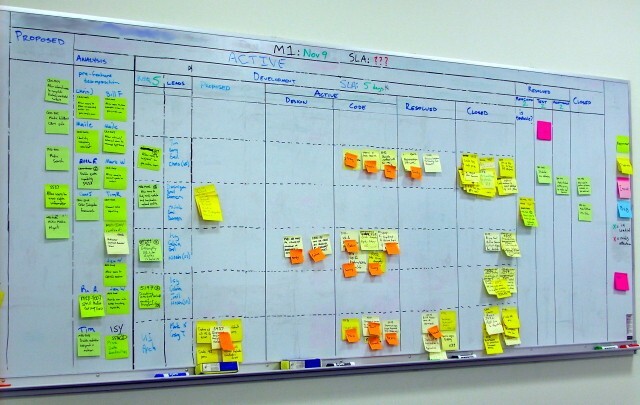 Generally, you have a Kanban board for each process (also called a value chain). So your back-office people may have one Kanban board, your product-development team may have several or one, your marketing department may have another — wherever you have a workflow pattern, you can set up a Kanban board. 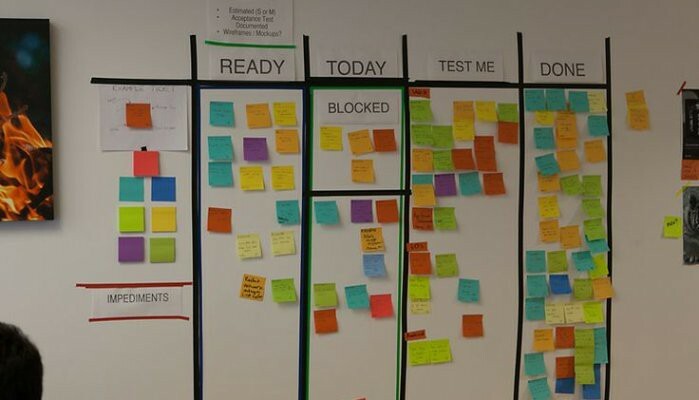 There are as many kinds of Kanban boards as there are companies and groups within companies, but they do share many of the same qualities. 1. Make work visible. You must commit to putting everything on the wall, so everyone can get a birds-eye-view of all the work being done. For a single group of people who work together, nothing can be in someone’s head or on a different system. In many cases, the size and colors of the cards have meaning — they often represent units and priority of work. And often there are little red or green dots that flag problems and resolutions. All of this must be systematized and visible. 2. Limit work in progress. This is the central concept of Kanban. You must make sure that the amount of work “in progress” is not more than the resources to do the work. Any time you try to shove more work into the area on the board, it becomes immediately apparent. Ideally, the physical space allotted doesn’t allow for more work than can be done. Bottlenecks are easily spotted and people can “stop everything” to work on a problem, get it resolved, and go back to the flow. The idea of “just working harder” to jam more work into the day or week is not allowed. 3. Look to the right. A Kanban system is a pull system. Only when something is finished can a new thing can be started. No matter how upset the boss is, he can’t jam something into your schedule until people are done doing what they have committed to already. In many cases, the wall is not a calendar, and there is no regular pace — the flow of work leaving each box lets you move in the next piece of work in. In other cases, you design it with a weekly or two-week cadence, and no one can interrupt the current work commitment but must wait until the “sprint” is finished before rearranging priorities. By looking to the right to see what to do next, everyone focuses on work that is stuck before bringing in anything new. Along with this comes a set of agreements on who can move what, when, and how. Because salespeople typically use tools that effectively push projects in from the left, they often want to override the system and jam more work in than can be done. The only way to resolve this is to train the salespeople to look at the big picture and work with the team to decide which projects to accept, preventing impossible situations later. 4. Everyone estimates his/her own time. In Kanban, you estimate your own time. Imagine that at the Monday morning planning meeting, each person estimates how much time each task will take for the whole week, day by day, hour by hour, until Friday. The first week you do this, you’re not even close — you probably way overestimate what you can do. But by the sixth or seventh week, you and your colleagues are calibrated estimators — other people can count on you to deliver what you say you will. This aspect alone should compel you to try Kanban. 5. Modify and maintain the system continuously. A group of volunteers or professional facilitators must constantly be trying to improve the system. Almost no Kanban system should look the same after a year of use. You can set up discrete “releases,” or just keep making small improvements, but you must commit to continuous improvement to make it work. You may find yourself using extra sticky notes or color-coded dots to flag things that need immediate attention. Another color could be for deliverables required by a certain date. 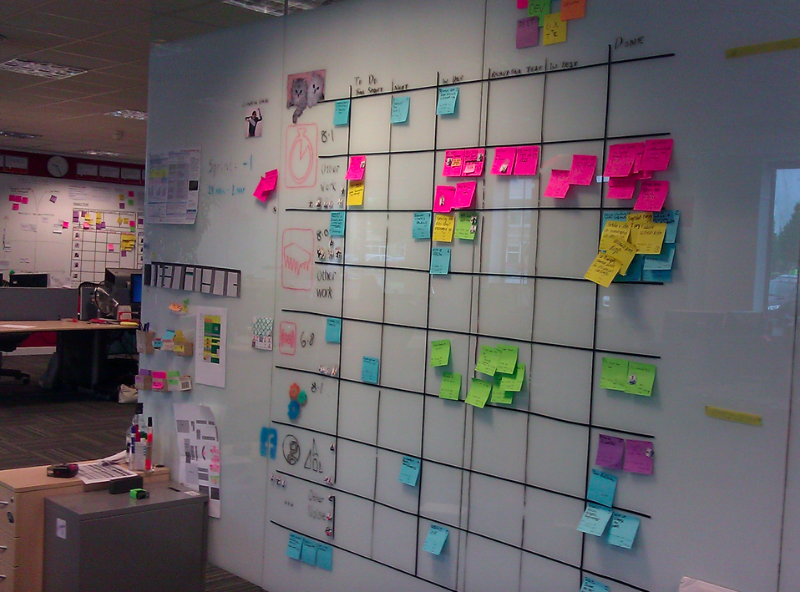 At some places, after a few years, the Kanban system becomes pretty stable. They have learned how to deal with black-swan type events and still keep the system working. 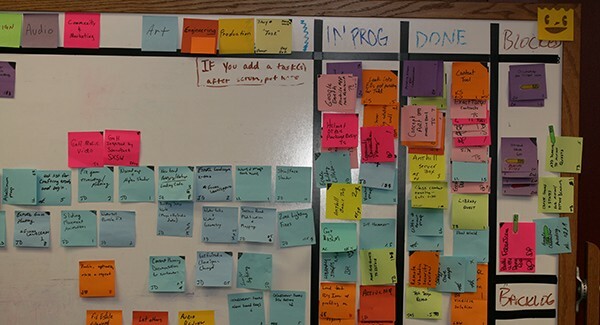 In most cases, you should use sticky notes and tape rather than software, because putting everything on the wall lets you really engage with the structure of the work. The magic of Kanban is not that you can move the cards along the board, but that you can also move the tape: when you realize something could be done better, you rearrange the columns (modifying the steps or conditions required to get the work done), changing the way the work flows through the system. Kanban is now being used in doctor’s offices, law offices, mortgage processing, sales, accounting, and many other places where workflow is more or less continuous. A related system is called SCRUM, which is often used by IT departments. SCRUM is heavily time-based and usually goes in two-week sprints, without limiting work in progress. Many groups use a combination of the two, so they get a “replace as you go” system that still has a weekly or bi-weekly delivery cadence. 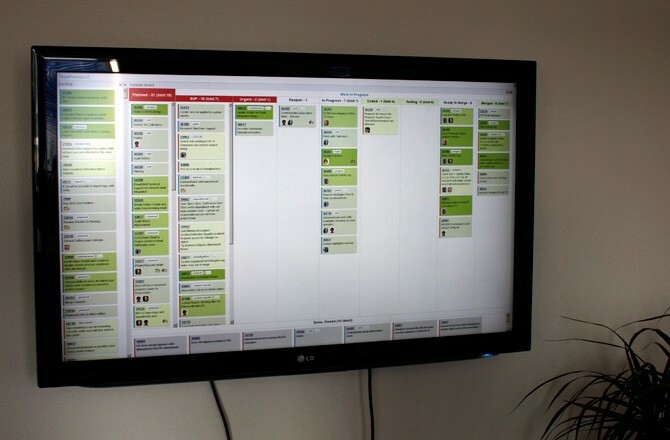 Kanban and SCRUM have a lot in common. The main purpose is to surface issues quickly and create trust. People who coach Kanban and SCRUM emphasize listening, empathy, asking for help, and swarming to fix problems as soon as they come up. To get started learning about Kanban, I highly recommend reading Joy, Inc., by Richard Sheridan, one of the best books on how to create a company culture and process that really works. In Kanban, you build slack into the system. Most companies eventually adopt the 70/20/10 rule: 70% of time reserved for core work activities and deliverables. 20% for less critical but have-to-do-sometime activities that could potentially be more fringe, or improving tools, or doing extra projects that may turn into something significant later. And 10% is reserved for experiments, moon shots, hackathons, brainstorms, blog posts, and trying things that otherwise wouldn’t get time in a normal work week. That final 10% is a convexity portfolio — most of it doesn’t work, but the few that surprise you go on to become products or new offerings that help stay ahead of the competition. I’ve left out a lot, because I want people to actually read this. A great way to get started is to assemble a volunteer team to put a Kanban system in place and experiment your way to success with it. Two things that will help are going to Menlo Innovations (the company behind the book Joy, Inc.) for a tour and a workshop, and reading Kanban, by David Anderson. 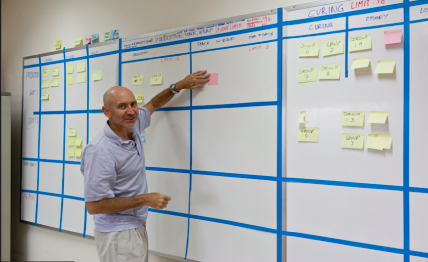 David has been instrumental in spreading the use of Kanban in software development, building trust and creating collaborative cultures at thousands of companies. There is plenty of software for Kanban. Many teams swear by it, and there are obviously many advantages. But you should start with a card system and get it working before you switch to software. For distributed teams, many companies have people who maintain the same card walls in two locations, so everyone can see what’s happening. To learn more about the software ecosystems, please readThe Quickstart Guide to the 21st Century. There are many many YouTube videos on setting up Kanban systems, both using cards and software. I hope this has convinced you to give it a try. It isn’t going to work in the first week — you need to make an investment and commit to the five principles. But give it three months, and I think you won’t likely go back to the way you worked before. Personal Kanban — a lovely book on applying the principles to your life, even managing kids! For everyone else but IT, we’re just starting with Kanban, and there are few practitioners. While there are several culture consultants, Eric Jansen and I are the only people I know offering Kanban training for the whole company, outside of IT and product development (which I leave to the IT coaching experts). I recently learned about John Grant, who helps legal teams adopt Kanban. I hope this will prompt people to send me more links to web sites of others, and this list will grow over time. Please come back and see who’s offering Kanban training for the whole company outside of IT. You can easily get started yourself, using the resources I’ve listed. But if you have any questions or want a one-day workshop to Kanban or pairing, please contact me. As always, see my profile before connecting, and learn more at BusinessAgilityWorkshop.com.